What's really going on here? Are these people ASLEEP? Hypnosis has long ago been proven to be a real, definable phenomenon with medical and psychological benefits, when used in a clinical environment. 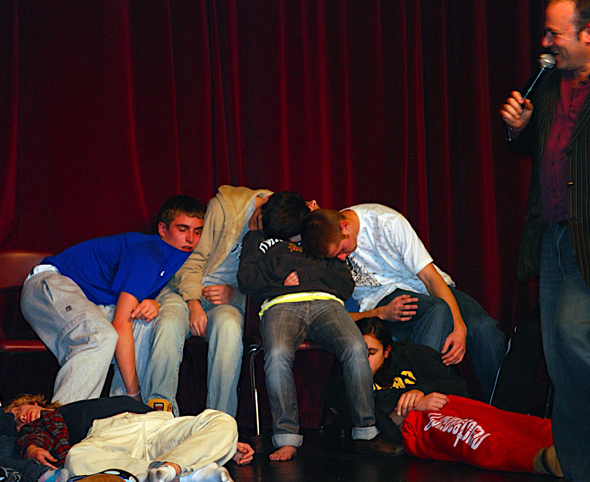 In stage show or hypnosis demonstrations, the hypnosis is just as real. In fact a good hypnotist doesn’t want pretenders; they’re simply not as entertaining as people who are really in trance. Q: Can EVERYONE be hypnotized? What makes someone a good candidate or volunteer? Hypnosis demands focus, concentration and imagination. People of superior creativity and intelligence usually make the best volunteers. Contrary to what some people assume, being intoxicated does not make hypnosis easier. Hypnotic trance happens when volunteers to take control of their own psychological states and accept the hypnotist’s suggestions. Being in control of yourself is the first step. Q: What does hypnosis feel like? Do people on stage remember what they do during the show? Everyone experiences hypnosis differently but one experience is common: although you will appear to be ‘asleep’, your mind will remain active and engaged the whole time. Trance does not render volunteers unthinking ‘robots’ but fully engaged participants. You will probably be aware that you are on stage, dancing around like a rock star. You just won’t care. You’ll be focused on being the best rock star you can be. Q: I would love to see my friend, relative or work associate do some of those 'crazy' things that I have seen people do at shows. Can you come and hypnotize one specific person? Hypnosis is a voluntary activity that demand not just passive agreement (“Yeah, go ahead and TRY to hypnotize me”) but active participation and the right conditions. Because of this it’s usually a bad idea to limit volunteers to a prescribed list. What works best is to open participation to everyone and see who’s willing and ready to be part of the show. Q: I have thought about volunteering at a hypnosis shows, but I'm afraid the hypnotist would make me do something embarrassing or humiliating. Can that happen? Q: Can people have negative residual effects to going into hypnotic trance? No, definitely not. Hypnosis in the real world is quiet different from hypnosis in the movies. In the real world, people cannot ‘get stuck’ in trance, nor can someone end up with permanent side effects. Hypnosis is often used to help people improve their lives, but only if the subject is actively interested and motivated to make that change. The good news is that in hypnosis, accidents can’t happen! Q: What makes one hypnotist 'better' then another? How should I decide on who I should hire? Your best choice is to pick a hypnotist who has experience and success with the kind of event you are planning. Many hypnotists spend most of their time working one-on-one with clients and have limited experience entertaining people. You’re best bet is a full time professional stage act; someone who specializes in entertaining audiences similar to your audience. Before you decide on a performer you should certainly, watch his promotional video, read her letters of recommendation and review his list of previous clients. Lots of people have trained to put people in trance; fewer are experienced entertainers.